Severo-Osetinsky Zapovednik, in Russia’s Republic of North Ossetia-Alania, protects forest and alpine ecosystems in the mountains of the Central Caucasus. Here beech, hornbeam, and pine forests climb steep slopes of gorges, opening up to flowering alpine meadows and rockslides. Waterfalls cascade down cliff faces, freezing in winter to form spectacular icy columns. Located in the Ardon River basin, the nature reserve protects the vulnerable alpine habitat of tur, chamois, brown bear, lynx, and other animals. European bison were reintroduced here in the 1960s. Endemic plants and animals found nowhere outside the Caucasus are guaranteed protection here from human pressures of grazing, farming, and mining on neighboring lands. Endemic Eastern Caucasian turs easily maneuver the rocky terrain. Elevations in the reserve range from 650 m to 4,600 m above sea level. European bisons were first restored to the reserve in the 1960s. The ruins of an ancient village overlook an alpine valley. Bieberstein's bellflower is found in the forests of Side and Greater Caucasus ranges. The pointed cone of a lofty peak serves as backdrop to an alpine stream. Colchic iris grows in forest clearings of Forested and Pasture ranges. A creek in a narrow gorge freezes into an icy waterfall in winter. There are 42 species of mammals in the zapovednik, including seven rare species, 11 endemic species, 13 subspecies, and one endemic genus – the very unusual long-clawed mole-vole (Prometheomys schaposchnikovi). East Caucasian or Daghestan tur (Capra cylindricornis) and Caucasian chamois (Rupicapra rupicapra caucasica), respectively endemic species and subspecies, easily maneuver the rocky terrain. Stoat (Mustela nivalis) and weasel (Mustela nivalis) scurry over the rocky ground in the high mountains. Predators such as brown bear (Ursus arctos) and lynx (Lynx lynx) roam up and down the mountainsides, frequenting forests and alpine ecosystems alike, while stone marten (Martes foina), red fox (Vulpes vulpes), and grey wolf (Canis lupus) seldom rise above timberline. Wild boar (Sus scrofa), roe deer (Capreolus capreolus), red deer (Cervus elaphus), European bison (Bison bonasus), forest marten (Martes martes), and European wild cat (Felis sylvestris) prefer broadleaf forests. The European bison, successfully reintroduced to the area in the 1960s, has since had a less than optimal fate. From 1964-67, a total of 47 European bison were reintroduced to the Tseisky Sanctuary, now under the jurisdiction of Severo-Osetinsky Zapovednik. By 1978, the herd had increased to 115 animals. While some of the bison dispersed into the reserve and onto adjacent hunting lands, the population in the sanctuary continued to rise and reached 220 animals by 1990. The bison’s large numbers had detrimental impacts on forest and shrub vegetation and brought about an epidemic of Dutch elm disease. The animals also had a negative effect on the rare yew tree and, in areas, devastated blackberry thickets, an important component of the winter diet for both bison and roe deer. In the mid 1980s, fearing that the high density of bison would lead to catastrophic disease or starvation, the zapovednik administration requested that some of the animals be captured and transported to another reserve. However, their requests went unheard and the animals were not relocated. The winters of 1991 and 1992 brought large amounts of snowfall. Simultaneously, illegal poaching of the animals rose due to the increased access to rifles as a result of ethnic conflicts and warfare in the region in the early 1990s. Bison numbers sharply declined: by 1998 there were only 54 animals left; today there are about 50, and their numbers appear to have stabilized. While the decreased density of bison is optimal for plant communities (yew groves and blackberry thickets have since regenerated), their low numbers make this population vulnerable to extinction. Seven species of bats inhabit the reserve. Of these, only common and Kuhl’s pipistrelles (Pipistrellus pipistrellus, P. kuhlii) and grey long-eared bat (Plecotus austriacus) can be found in summer. Lesser mouse-eared bat (Myotis blythi) and greater and lesser horseshoe-nosed bats (Rhinolophus ferrumequinum, R. hipposideros) form large wintering colonies in the Shubi-Nykhasskaya Cave in the Skalisty (Rocky) Range. Eurasian hedgehogs (Erinaceus concolor) are found in thickets and groves in the broadleaf forest belt. The Caucasian lesser shrew, Caucasian shrew, and Radde’s shrew (Sorex volnuchini, S. caucasicus satunini, S. raddei) are found in habitats from broadleaf forests to alpine zone. The forest dormouse (Dryomys nitedula) and fat dormouse (Glis glis) are perhaps the most interesting rodents in the zapovednik, resembling small squirrels with long, furry tails, while lesser mouse (Apodemus uralensis) and Daghestan vole (Microtus daghestanicus) are the most common ones. Of the 207 birds identified in the zapovednik, 18 species are rare. Three of the species and 54 subspecies are endemic to the Caucasus Mountains. Five rare species nest in the reserve – bearded vulture (Gypaëtus barbatus), Egyptian vulture (Neophron percnopterus), golden eagle (Aquila chrysaetos), peregrine falcon (Falco peregrinus), and the endemic Caucasian blackgrouse (Lyrurus mlokosiewiczi). The endemic Caucasian snowcock (Tetraogallus caucasicus) is a notable resident of high mountain ecosystems, as are the great rosefinch (Carpodacus rubicilla) and Güldenstedt’s redstart (Phoenicurus erythrogaster), which nest in cliff crevices and between rocks. The Caucasian warbler (Phylloscopus lorenzii) is as typical to rhododendron thickets as water-pipit (Anthus spinoletta) to subalpine and alpine meadows. The curious Eurasian dipper (Cinclus cinclus) runs along the bottom of fast-running alpine streams feeding on aquatic insects. As its name suggests, the wallcreeper (Tichodroma muraria) has no difficulty climbing cliff walls and rocks in the high mountains. About 160 bird species migrate through the reserve, including the most numerous common crane (Grus grus), bee-eater (Merops apiaster), quail (Coturnix coturnix) and black kite (Milvus migrans), and rare imperial and steppe eagles (Aquila heliaca, A. nipalensis), osprey (Pandion haliaetus) and short-toed eagle (Circaetus gallicus). Five species of reptiles are found in the reserve, namely Orsini’s viper (Vipera ursini), listed as endangered by IUCN, grass snake (Natrix natrix), smooth snake (Coronella austriaca), Caucasian lizard (Lacerta caucasica), and slow worm (Anguis fragilis). The Iranian long-legged wood frog (Rana macrocnemis) is the most widespread of the three amphibians found in the zapovednik, living as high as 2,500 m above sea level. The green toad (Bufo viridis) is found even higher – up to elevations of 3,000 m. European tree frog (Hyla arborea) resides in the moist understory of forested foothills. The only fish in the zapovednik is the brook trout (Salmo trutta fario). More than 2,000 insects have been identified in the zapovednik, although surveys continue to find new species each year. Several species of butterflies have been listed as endangered, including the European and scarce swallowtails (Papilio machaon, P. podalirius), apollo and clouded apollo (Parnassius apollo, P. mnemosyne), and death’s head moth (Acherontia atropos). Rare beetles include the Caucasian ground beetle (Carabus caucasicus) and the European calosoma beetle (Calosoma sycophanta). Plant life in the Severo-Osetinsky Zapovednik is extremely diverse, with a number of relic and endemic species found nowhere outside the Greater Caucasus Range. Approximately a fifth of the reserve is forested with more than 100 species of trees and shrubs. Vegetation is characterized by distinct vertical zonation according to elevation, ranging from broadleaf forests on the Pastbischny (Pasture) and Skalisty (Rocky) ranges to rock and scree vegetation and glaciers on the Bokovy (Side) and Greater Caucasus ranges. Mountain steppe fragments and arid mountain plant communities are found in the so-called Sunny Valley between the Skalisty (Rocky) and Bokovy (Side) ranges. The forest belt from 650-2,400 m primarily consists of mixed Caucasian hornbeam (Carpinus caucasica) and Oriental beech (Fagus orientalis) forests, mixed hornbeam-oak (Quercus petraea) forests – on Pastbischny (Pasture) and Skalisty (Rocky) ranges, Caucasian pine (Pinus kochiana) stands, birch groves (Betula pendula, B. raddeana, B. B. litwinowii), and mixed pine-birch forests – mainly on the Bokovy (Side) and Greater Caucasus ranges. Trautvetter’s maple (Acer trautvetteri) and mountain ash (Sorbus caucasigena) are found in pine-birch forests. However, Trautvetter’s maple may form separate stands in broadleaf forests on Pastbischny and Skalisty ranges. Speckled alder (Alnus incana), a common deciduous shrub, flanks waterways alongside sea-buckthorn (Hippophae rhamnoides). Caucasian honeysuckle (Lonicera caucasica), European privet (Ligustrum vulgare), wahoo (mainly Euonymus europaea and E. verrucosa), and other plants are found in the forest understory. Sparse forests of gnarled dwarf birch (Betula raddeana, B. litwinowii) are found at the upper limits of timberline. The subalpine belt is made up of gramineous-herb communities. Low-lying carpets of alpine vegetation and heathlands are widespread in the alpine belt. Rock and scree communities found on cliffs, near glaciers, and on rockslides are particularly remarkable, with relic species such as Hoefft’s petrocoma (Petrocoma hoefftiana). There are around 2,000 species of higher plants in the Severo-Osetinsky Zapovednik and its buffer zone. This comprises a third of all the plants found in the Caucasus Region. Thirty-four species in the reserve are listed in the Russian Red Book of rare and endangered plants. The rare Radde’s birch (Betula raddeana) is a relict from the Tertiary Period, easily identified by its pale pink bark. The European yew (Taxus baccata), also from the Tertiary Period, is a particularly valuable and rare species. Ardon bellflower (Campanula ardonensis) is a narrow endemic to the region, as is Ossetian bellflower (C. ossetica). Lagodekhi snowdrop (Galanthus lagodechianus), Dinnik’s and column saxifrages (Saxifraga dinniki, S. columnaris), and eremurus (Eremurus spectabilis) are some of the other plants listed in the Russian Red Book. Over 50 species are listed in the second edition of the Red Book for North Ossetia, including Colchic holly (Ilex colchica), Colchic ivy (Hedera colchica), Oriental spruce (Picea orientalis), Caucasian fir (Abies nordmanniana), and others. The zapovednik hosts a number of decorative, edible, medicinal, and melliferous plants. Five hundred species of mushrooms have been identified in the reserve. Severo-Osetinsky Zapovednik is situated in the eastern part of the central Greater Caucasus Range in the Alagir District of North Ossetia-Alania. The zapovednik includes slopes of the Pastbischny (Pasture), Skalisty (Rocky), and Bokovy (Side) ranges, and part of the Great Divide (or watershed) of the Greater Caucasus Range. The zapovednik falls entirely within the watershed of the Ardon River. Elevations range from 650 m to over 4,600 m above sea level. Wilpata Peak is the highest point in the reserve (4,646 m). The relief in the zapovednik is exclusively mountainous. Glaciers cover approximately 37 km2 of the reserve, primarily in the Tepli-Arkhonsky and Wilpata-Adaikhokhsky mountains. Tseisky Glacier, extending eight kilometers, is the largest in the reserve. Avalanches and rockslides occur frequently. The Ardon River, the largest river in the reserve, is the eastern tributary of the Terek River and begins in the Zaramag Hollow where several smaller rivers come together. The largest tributary of the Ardon is the Fiagdon, joining the river outside the zapovednik. 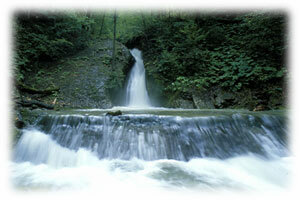 Most of the waterways in the reserve are fast-flowing mountain streams and rivers. The climate in Severo-Osetinsky Zapovednik is impacted by its location on the border between temperate and subtropical climate zones. Subsequently, winters are characterized by large temperature variations. Summers are warm and humid. Average annual temperatures range from 9oC in low-lying regions to -2oC in the high mountains. The warmest months of the year are July and August with average temperatures reaching 8o to 20oC from high elevations down to the foothills and valleys. The coldest month is February with temperatures from -2o to -12oC. Rain falls mostly from May to July, with average annual precipitation two times higher (1,000 mm) on the northern slopes of the Skalisty (Rocky) Range than in the basins between ridges (400 mm) due to the “rain shadow” effect. Autumn is the nicest time of the year in the zapovednik, when the weather is warm and dry and the leaves on the trees turn yellow and orange on a backdrop of snow-capped mountain tops and clear blue skies. Severo-Osetinsky Zapovednik has a number of spectacular natural features, such as caves, unique geological formations, and waterfalls. The second largest karst cave in North Ossetia is located in the zapovednik. Called Shubi-Nykhasskaya, the cave extends for more than a kilometer and is home to three rare species of bats. The cave’s corridors and halls are covered with fantastic stalactites and stalagmites. The zapovednik also protects a number of archeological sites, including cave dwellings, reinforced by rock walls in places, near the Ursdon, Dzivgis, and Nuzal settlements. Towers and stone crypts from the Middle Ages are also protected in the reserve. Humans have inhabited the mountainous region of Ossetia since ancient times, inevitably altering the landscape. In 1768, geological explorer S. Vonyavin noted that the Alagir and Kurtatin gorges had been largely deforested and pointed out the need to conserve forests in this area. Mountain lands have historically been used for sheep and cattle grazing and agriculture. Today, the Transcaucasus Highway runs through the Alagir Gorge, a hydroelectric dam is under construction, and lead and zinc is mined in the nearby mountains. In 1958, the Tseisky Regional Zakaznik (sanctuary) was created over an area of 14,500 ha to protect wildlife and plant ecosystems in the Ardon River basin from growing human pressure. Later, its territory was enlarged to 73,000 ha. Part of the sanctuary was included in the Severo-Osetinsky Zapovednik when the strict nature reserve was established in 1967, and Tseisky Zakaznik remained on a territory between the Ardon and Fiagdon rivers on Lesisty (Forested), Pastbishchny (Pasture) and Skalisty (Rocky) ranges. In 1981, jurisdiction of the sanctuary was given over to Severo-Osetinsky Zapovednik. Today, the zapovednik and sanctuary combined cover 10 percent of North Ossetia-Alania. The two protected areas play a vital role in conserving vulnerable alpine and forest ecosystems of the central Caucasus Mountains. One of the important tasks of the zapovednik’s ranger service is to prevent forest fires, particularly in old growth forests. Poaching is a serious problem in the region, and the rangers must patrol the territory regularly to ensure that the protected regime is observed. The ranger service also works with local people to build awareness and ensure their support for the zapovednik. The scientific staff actively carries out research projects, publishing more than 500 scientific works and 10 scientific books. Scientists have compiled inventories of plants and animals in the North Ossetia-Alania Republic. An ecological visitor’s center and museum host hundreds of visitors per year, and as many as 5,000 tourists and alpinists visit the zapovednik annually. Amirkhanov, A.M., P.I. Veinberg, L.A. Guseva, A.L. Komzha, Yu. E. Komarov, N.A. Komarova, I.T. Kuchiyev, A.D. Lipkovich A.D. (ed. ), K.P. Popov, and N.D. Filonov. Severo-Osetinsky State Zapovednik. Ir Publishers, Ordzhonikidze, 1989 (Russian). Amirkhanov, A.M. (ed. ), I.T. Kuchiyev, P.I. Veinberg, and Yu. E. Komarov. Severo-Osetinsky Zapovednik. Agropromizdat Publishers, Moscow, 1988 (Russian). Amirkhanov, A.M., A.D. Lipkovich, P.I. Veinberg, K.P. Popov, and S.K. Alekseyev. “Severo-Osetinsky Zapovednik.” Zapovedniks of the USSR: Zapovedniks of the Caucasus. Mysl Publishers, Moscow, 1990 (Russian). Popov, K.P. “Severo-Osetinsky State Zapovednik.” Zapovedniks and National Parks of the Northern Caucasus. Kavkazsky Krai Publishing Agency, Stavropol, 2000 (Russian). Zabelina, N.M, L.S. Isaeva-Petrova, and L.V. Kuleshova. Zapovedniks and National Parks of Russia. Logata, Moscow, 1998 (Russian and English). Special thanks to Pavel Veinberg, Konstantin Popov, and Yuri Komarov of Severo-Osetinsky Zapovednik for their assistance in preparing this text.